The Roman Catolick Kirk is the lairgest Christian kirk in aw the warld. Ane oot o ilka sax humans belangs this kirk. It is lead bi the Pape an it haes ower ae billion follaers un da auld t'eeder. Accordin tae Catholics, the verra first Pape wis St. Peter that wis made Pape bi Jesus himsel. Sae the Roman Catolick Kirk can follae its line aw the wey back tae St. Peter, in a direct line o succession throu the Papes (the Haily Faithers or Beeshops o Roum). The Pape the nou is Pape Francis. In Scotland thare's ower 800,000 Catolick fowk. ↑ "Presentazione dell'Annuario Pontificio 2018 e dell' "Annuarium Statisticum Ecclesiae" 2016" (in Italian). Sala Stampa della Santa Sede. 13 June 2018. Retrieved 13 June 2018. ↑ "Number of Catolicks and Priests Rises". Zenit News Agency. 12 February 2007. Retrieved 2008-02-21. ↑ "CIA World Factbook". United States Government Central Intelligence Agency. 2007. Retrieved 2008-02-28. 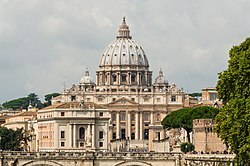 Wikimedia Commons haes media relatit tae Roman Catholic Church. This page wis last eeditit on 17 August 2018, at 05:36.